Im Tuftli, 2-room apartment 70 m2, on the top floor, south facing position. Bright, modern and cosy furnishings: living/dining room with Scandinavian wood stove and cable TV (flat screen), CD-player. Exit to the balcony, south facing position and west facing position. 1 room with sloping ceilings with 2 beds (90 cm, length 200 cm), cable TV (flat screen). Open kitchen (oven, dishwasher, 4 ceramic glass hob hotplates, freezer, electric coffee machine, Capsules for coffee machine (Nespresso) extra, steamer, raclette grill, fondue Set (cheese)) with bar. Exit north facing position. Bath/shower, sep. WC. Parquet floors. Balcony, south facing position and west facing position. Balcony furniture. Beautiful view of the mountains. Facilities: logs (extra). Internet (WiFi, free). Garage space n 3 at 100 m. Please note: non-smokers only. Fire extinguisher, no lift. Small apartment house Im Tuftli. In the centre, on a main road, south facing position. In the house: central heating system, washing machine, tumble dryer (for shared use). Linen change (suppl. charge extra). Towel change (suppl. charge extra). Room cleaning on request (extra). Storeroom available. In Winter: please take snow chains. Parking at 100 m. Shopping centre 5 m, restaurant, bar 10 m, bakery 100 m, bicycle rental 200 m, bus stop Grindelwalderhof 20 m, railway station Dorf 300 m, outdoor swimming pool 2 km, indoor swimming pool 200 m. Golf course (9 hole) 2.5 km, tennis 2 km, minigolf 20 m, sports centre, gondola lift 200 m, ski rental 100 m, ski bus stop 20 m, cross country ski track 2.5 km, children's playground 200 m. Well-known lakes can easily be reached: Thuner- / Brienzersee 18 km. Please note: no lift. Ski bus (free of charge). Free ski bus service to the ski region First and kleine Scheidegg/Männlichen. Please note: Loading and unloading of baggage is possible at the holiday house. 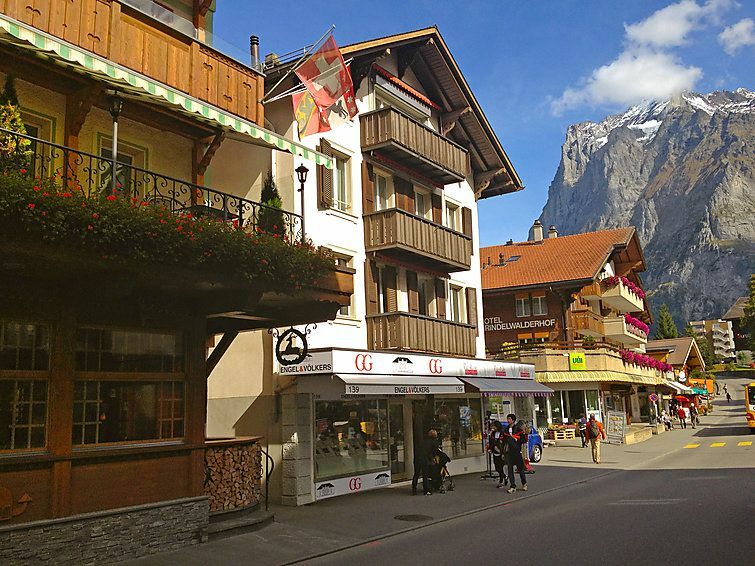 We LOVED Grindelwald and we loved our apartment! It was perfectly located and beautifully appointed with everything we needed. The flat is right in the middle of town, close to endless hiking trails, delicious restaurants and shopping. We hiked daily and enjoyed wonderful meals. We will definitely stay here again. The staff was so helpful and easy to rely on if we had questions. You cannot go wrong with this beautiful apartment. Amazing view. Quality decor and superb apartment.